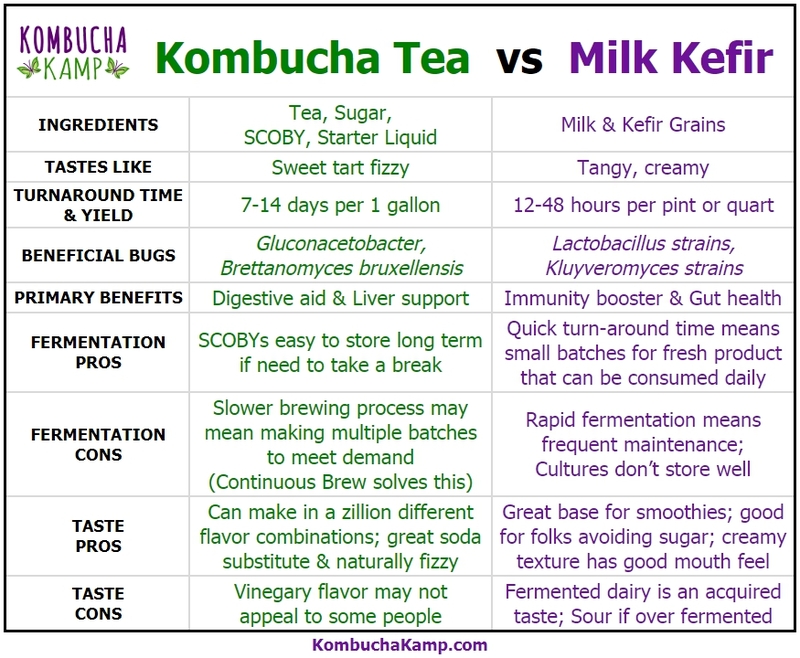 Kombucha vs Kefir: Which Ferment is Better, Kombucha Tea or Milk Kefir? Kombucha vs Kefir: Fermented Food Fight! Fermented foods and drinks are vital to human health but if you had to choose only one, how would you pick your favorite? To help you do just that, we look at the pros and cons of Kombucha vs Kefir. With two heavyweights duking it out, who will emerge the winner of the Kombucha vs Kefir Food Fight? Kombucha is the go-to soda and energy drink replacement beverage. Refreshing, tangy with a hint of sweet and in any flavor you can imagine, the light effervescence is just enough to tickle the palate. Even the mouthfeel is similar to soda – it’s the fun of pop without the negatives of artificial CO2. Plus, it contains organic acids that nutrify the body, naturally improving digestion and supporting the liver. As an alcohol mixer or replacement, Kombucha is the bomb! B-vitamins and glucuronic acid counter the negative effects of cocktails, while the bright colors and bold flavors look great even in a mocktail. Our own experience and that of many others indicates that regular consumption of KT also reduces cravings for alcohol or eliminates them entirely. Trust YOUR gut! If you can brew a cup of tea, you can make Kombucha! However, it does require patience as the process can take a week or longer for the primary fermentation and then another few days if you are flavoring it. We bottle age our Kombucha for a few weeks – which can lengthen the wait time. How long exactly will vary depending on each person’s brewing environment, taste preference and bottling style. Flavoring is definitely half the fun and creativity of brewing Kombucha though many people enjoy it without any additional flavors. Bonus, they can drink it sooner! Kombucha is fermented sweet tea. A Kombucha SCOBY (Symbiotic Culture of Bacteria and Yeast) is added to the sweet tea mixture and allowed to ferment aerobically for 7-14 days to yield a naturally fizzy, tangy beverage. It’s an acetic acid ferment like vinegar. Kombucha made at home typically has a balance of tangy and sweet. Always harvest when the brew has the flavor the you enjoy most. Many people crave the acidity of Kombucha to balance out heavy and rich foods, or whenever they want a digestive boost. CAN I BUY IT AT THE STORE? Yes! From mainstream grocery stores to coops and convenience stores to the airport to organic stores like Whole Foods & even Costco, you can find Kombucha just about anywhere. Store bought Kombucha can range from sweet and light to downright sour depending on the brand. The variety in quality can be great. Some are pasteurized products while others are made by adding water to a concentrate. Look for strands of culture floating in bottle or the words “raw” on the label to find traditional brews. These brands also tend to cost more. Pasteurized Kombucha products are a superior choice to high sugar sodas and juices. Some are fortified with additional probiotics, and they can often be stored at room temperature since they are not active. Kombucha creates healthy organic acids that support digestion and liver health. It makes a great substitute for soda, energy drinks and even beer and wine. Many drinkers claim improved energy, digestion and feeling of well being. If you can brew a cup of tea, you can make Kombucha. Like every recipe, it is both science and art to create delicious brews batch after batch. Many prefer the longer fermentation time of Kombucha vs kefir as it means less frequent fuss and mess. Continuous Brew makes it even easier. The longer fermentation time means some people are prone to forgetting about their brew until it has already turned to vinegar. The taste can be off-putting to some at first but there are lots of great ways to flavor it or dilute with water or juice plus you still get all of the benefits! “My milk kefir smoothie brings all the bacteria to the yard!” Toss in your favorite fruits, nutritional boosters and ice and blend it up. The creamy mouthfeel and tanginess pairs well with the natural sweetness of the fruit (and a spoonful of honey!). Whole milk offers the best flavor and texture. Known as “drinkable yogurt”, homemade kefir doesn’t always have the same consistency as commercial versions, which add thickeners. It’s easier to ferment than yogurt however, due to the short fermentation cycle, you might end up making too much. Stick to small batches to drink entirely in one day for best success. Extra grains can be tossed into the smoothie for additional probiotics. If you need to take a break, pop them in the fridge, but keep in mind that the first few batches after pulling them out will have a thinner texture until they are fully reactivated through consistent feeding. It’s easier to store Kombucha vs kefir, which do better with regular attention. Incredibly versatile, we often use it in place of buttermilk to make light and fluffy pancakes (gluten free version of the recipe coming soon!) or tenderizing marinade. It has great leavening properties and adds a unique sourness that gives a bite to baked goods and makes juicy fried chicken. Milk kefir is fermented milk. Kefir grains (not actually a grain, rather a polysaccharide composed of lactose loving bacteria and yeast) are added to raw or pasteurized dairy milk and fermented on the counter for 12-48 hours. The resulting product is often referred to as “drinkable yogurt” due to it’s thinner consistency. It also makes a great substitute for buttermilk. Milk kefir is luscious and a little tangy. Higher fat content in the milk yields a creamier and more nutrient dense product. Some drink it plain whereas others drink it in smoothies or flavored with fruit or herbs. Most commercial producers do not use grains to make their kefir. Instead, powdered or lab cultured organisms are added to milk, along with thickeners and stabilizers. This process provides for more commercial consistency. However it also means they lack the same diversity of organisms of a traditional fermentation process. But as always, it’s better to have the store bought version than none at all, and it makes a delicious snack on the go, with plenty of protein. Fermenting dairy makes it easier for the human body to digest. Traditionally humans consumed milk in a raw form, not pasteurized. When raw, milk contains bacteria that help the body digest the lactose in the milk. But when pasteurized, those bacteria are dead and can’t assist, making lactose digestion harder on the body. However when we ferment pasteurized milk, we are reintroducing those good bacteria. The result is that people who are otherwise sensitive to dairy can usually consume milk kefir. Fermentation also increases and makes more bioavailable all of the great nutrients present in milk. This includes calcium, magnesium, phosphorus and more! Plus it’s very filling so it makes a great occasional meal replacement (depending on how much sugar it contains, check the label on store brands!). Fermentation is a snap. Add the grains to the milk, cover and then return 12-48 hours later and voila – milk kefir is ready to drink! More here at the milk kefir recipe. For people who are actually allergic to the proteins in milk, fermenting dairy won’t help. 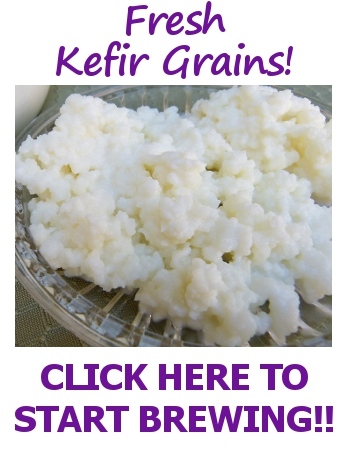 Also, kefir grains don’t store well unattended for long periods. They are most vital and make the most delicious kefir when you use them consistently. Whether you prefer the refreshing, uplifting fun of Kombucha or the satisfying nourishment of Milk Kefir, you are the winner of the Kombucha vs kefir battle just by adding fermented foods to your diet. Like all the finer things in life, both are acquired tastes and each offers completely different organisms, mouthfeel and flavor experience. Why not make it a double power punch and consume both?